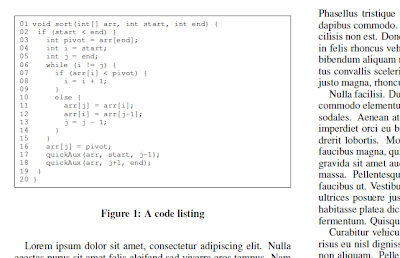 Even though LaTeX is a tool of, by, and for computer scientists, it sure doesn't make it easy for you to include code samples in your papers. 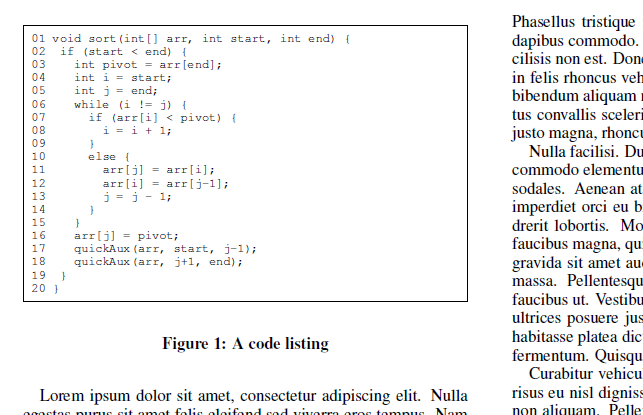 Sure, there is the verbatim package, but what if your code listing is too big, and the next font size down is too small? Also, how the heck do you draw a frame around the text? You should put line numbers in your code listings. This makes it easier to refer to particular parts of the code; easier for you in your exposition, or easier for your reviewers. It also seems to give the listing a clean, scientific look. Putting a box around the figure helps set it apart from the rest of the text, and avoids "bumping." However, LaTeX is surprisingly bad at letting you compose different commands; you can't just put an "fbox" around your verbatim and leave it at that. Instead, you need to construct it in an lrbox first, and then put the fbox around the lrbox. Actually, this box trick works well for the other problem: Finding the right font size. If you use a minipage, you can make it as exactly the number of columns wide as you need.